Two shells fired from Ukraine hit Russia near Kuibyshevo border checkpoint Gukovo in Russia’s southern Rostov region were evacuated over the gunfire on adjacent Ukrainian territory on Sunday, chief press officer of the Southern customs service department Rayan Farukshin told Itar-Tass. “Customs officers were evacuated at 6.30am Moscow time (3.30am BST) on Sunday after several shells had blasted near the state border. An hour after the fire stopped on Ukrainian territory Russian customs officers came back to their workplaces,” Farukshin said, adding that no people were wounded and no infrastructure of the border-crossing point was damaged. Customs officers from multi-way automobile border-crossing point Kuibyshevo were evacuated over automatic gunfire on Ukrainian territory on Saturday, Farukshin said. Officers of neighbouring border checkpoints also had to be evacuated regularly over a danger which is posed by combat actions on the other side of the border. 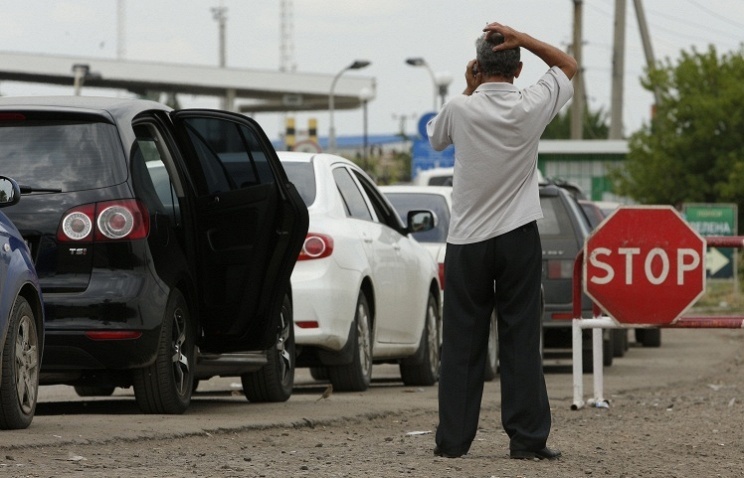 Over the halt in operation of the twin border checkpoints in Ukraine people and vehicles are not permitted to cross the border at multi-way automobile border-crossing points Novoshakhtinsk, Gukovo and Kuibyshevo. Personnel of Russian border checkpoints are on duty and are prepared to pass people and vehicles across the Russian state border.